The meatballs inside the Meatball Parm tasted fresh and they were combined with melted cheese and a rich marinara sauce. 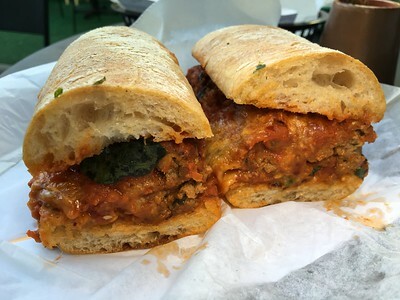 Again, I think the toasted artisan ciabatta made this sandwich taste much better than your ordinary Italian meatball sandwich. Low or no carb diners may select from an Italian chopped, a caesar or a Cali Kale salad. Salads range from $8 - $12. For an extra $5, you may have seared chicken or breaded chicken cutlet added to your salad. 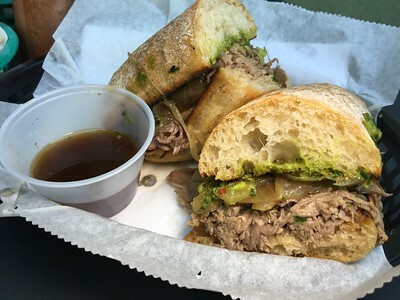 Fans of authentic Italian sandwiches will be pleased to learn that they have housemade giardiniera available. 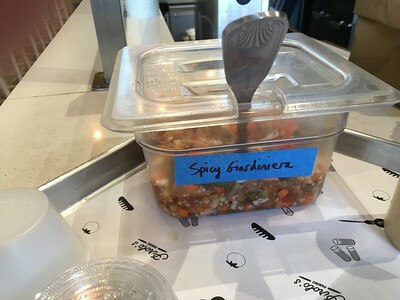 Giardiniera is a versatile condiment that can be used on a variety of different foods such as bratwurst, bruschetta, and sandwiches.Their version was chopped fine so that it could easily be used as a spread. 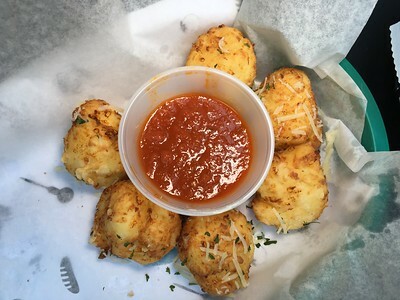 The cheese puffs are deep fried and crisp on the outside. They are paired with a marinara dipping sauce. I used the marinara sauce and I actually preferred combining the cheese puffs with the giardiniera because it benefitted from a pleasant tangy flavor. If you are a first-time visitor, you may not be aware that they have a private upstairs patio. Unlike the stools downstairs, the patio has seating suitable for groups. Music is piped there and a large screen monitor had music videos playing. 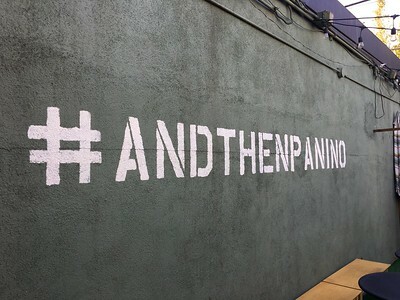 Instagrammers will have fun taking selfies against the #AndThenPanino hashtag on the wall. 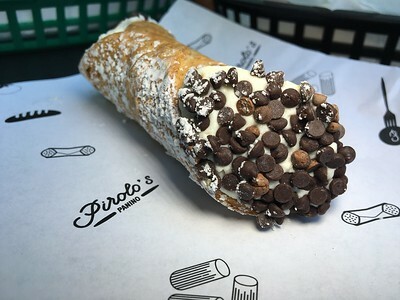 I was impressed that Pirolo’s Panino has cannoli on their menu. It is made fresh to order using a crunchy shell that is piped with creamy cheese mixture made with ricotta. The ends of the cannoli are finished off with chocolate chips and dusted with powdered sugar. The result is one of the best I’ve had in LA. Pirolo’s Panino is open 7 days a week from 11 a.m. - 7 p.m. Metered street parking is available. Great review!! All the sandwiches look so tasty. Can't wait to try the "Beef Dip".